Habit: Shrub, small tree, < 10 m. Stem: branches alternate, stiff or flexible; twigs generally not thorn-tipped; winter bud scales present, generally +- 3 mm. Leaf: scattered along branches or clustered on short-shoots, deciduous or evergreen; stipules generally deciduous; petioles generally glabrous; blade veins prominent or not. Inflorescence: flowers 1 or in cyme-like clusters in axils. Flower: unisexual (bisexual), generally on separate pls, generally < 3 mm; hypanthium bell-shaped to cup-like, 2--3 mm wide; sepals 4--5, thin, spreading, not keeled adaxially; petals 0 or 4--5; disk thin, adhering to hypanthium; ovary appearing superior or partly inferior, chambers 2--4, each 1-ovuled, style 1, stigma 2--4-lobed. Fruit: drupe, 2--3-stoned. Species In Genus: 110 species: temperate, few tropics; some of value in medicine or as dyes. Etymology: (Greek: name for plants of this genus) Note: W.H. Brewer collected Rhamnus cathartica L., considered invasive in parts of United States, in 1861, but it apparently never naturalized. Other taxa in TJM (1993) moved to Frangula. eFlora Treatment Author: John O. Sawyer, Jr. Habit: Small tree, < 10 m. Stem: bark gray; branches ascending; twigs purple. Leaf: evergreen; petiole 5--10 mm; blade 20--50 mm, elliptic, thick, glabrous, abaxially concave, base rounded, tip acute to rounded, mucronate, margin entire to toothed, veins prominent. Inflorescence: 1--6-flowered, glabrous; pedicels 3--6 mm. Flower: generally unisexual; hypanthium +- 2 mm wide; sepals 4; petals 0. Fruit: 2-stoned, 6--8 mm, red. 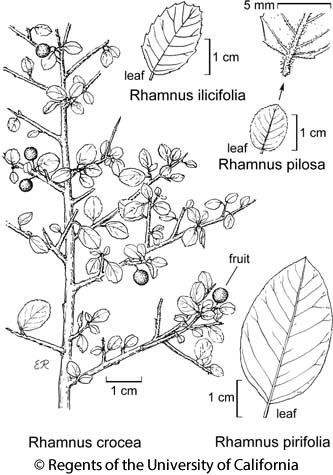 Jepson eFlora Author: John O. Sawyer, Jr.
Citation for this treatment: John O. Sawyer, Jr. 2012, Rhamnus pirifolia, in Jepson Flora Project (eds.) Jepson eFlora, http://ucjeps.berkeley.edu/eflora/eflora_display.php?tid=41075, accessed on April 21, 2019. ChI; Markers link to CCH specimen records. Yellow markers indicate records that may provide evidence for eFlora range revision or may have georeferencing or identification issues. Purple markers indicate specimens collected from a garden, greenhouse, or other non-wild location.